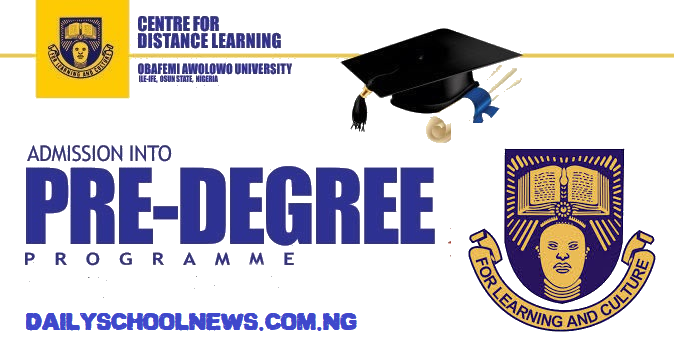 Are you interested in applying for the Obafemi Awolowo University, OAU predegree programme? Here are the complete requirements, courses availability, O’level required marks and total admission requirements. The Obafemi Awolowo UNiversity Pre-degree programme is specifically designed to be an intensive coaching curriculum/program which is aimed at preparing senior high school graduates (senior secondary) for university education. Most times, if you’ve been searching for admission into OAU for a long period of time, you can get admitted through their Predegree program. Due to some certain unqualified secondary curiculum which are being taught to students, it affects them when searching for admission into tertiary institutions. The OAU Pre-degree programme help students deal with the setbacks brough by these issues, providing them with a good head-start which will facilitate superior academic performance in the university. According to the institution management board, the OAU Predegree programme normally runs for two (2) contact periods, and they both run within a period of nine (9) calendar months. The programme is structured into two (2) contact periods, and each of them do have a 16 weeks with a minimum of four and maximum of five contact hours per week for each subject you’re taught. The school management also disclosed that there will be a three-week break between the first and second contact periods and one two weeks of examination during each contact. Lastly, take note that the end of the OAU pre-degree programme usually precedes the beginning of the University academic session. Take note that the closures of the University, due to one issue or another, do not affect the Obafemi Awolowo University predegre programme. • Once you’ve successfully make payment. A Receipt which contains a Receipt Number and Confirmation Order Number will be given to you at the Bank. (Please note that each of the above mentioned banks do charge a transaction fee.). • Go to OAUCDL website: (www.oaucdl.edu.ng) and Click on: “2019/2020 Pre-Degree Application”. Then proceed and read through the Instruction carefully. Other required information on the registration page. • After you have successfully created the account, you will be required to login back into your Account with your username and password. • To continue your registration, fill the online Application Form and upload your recent passport photograph (which must be less than 3 months old). • Take note that the passport photograph must meet the school’s specifications, which is: The passport photograph must be coloured with white background (Black and white photograph is not acceptable). • The passport size should not be more than 100KB. • After filling the OAU pre-degree registration form, logout and enusre that you save your username and password. I’ll recommend you write it down where you can always get it. • Ensure you keep visiting the school’s website from time to time for the date of the entrance examination and your admission status. • The OAU Predegree programme entrance examination will be computer based. • All predegree applicants are advised to keep checking the school’s website for the actual date of the entrance exam. • All candidates are required to register JAMB 2019 examination. • When registering for the post UTME screening, please use your Valid email address and personal phone number. • The school’s management does not accept any form of printed or downloaded copies of the registration form. • All applying candidates should note that the Pre-Degree Entrance Exam will be holding at Ile-Ife Centre and a centre in Ikeja, Lagos State. • Candidates are advised to carefully follow the Application Instructions and ensure they select the Correct SUBJECT COMBINATION. • Any applicant who fails to correctly choose the OAU predegree subject combination mayjeopardize their chance of getting admitted into the OAU predegree programme. The school management disclosed that having an overall score of 60% and above in the examinations and continuous assessment, which comprises of regular tests, assignments and the end of Contact period examination, is required. Any predegree student who scored 60% and above is qualified and will be considered for admission into Year 1 of the relevant degree programmes of the University. Take note that the Obafemi Awolowo University Admission is strictly based on merit and entry requirements and in proportion to the admission quota of the University for various Faculties. As earlier disclosed, the OAU predegree application fee is ₦15,000. If you’ve already registered for the OAU Predegree, Click Here to Login.